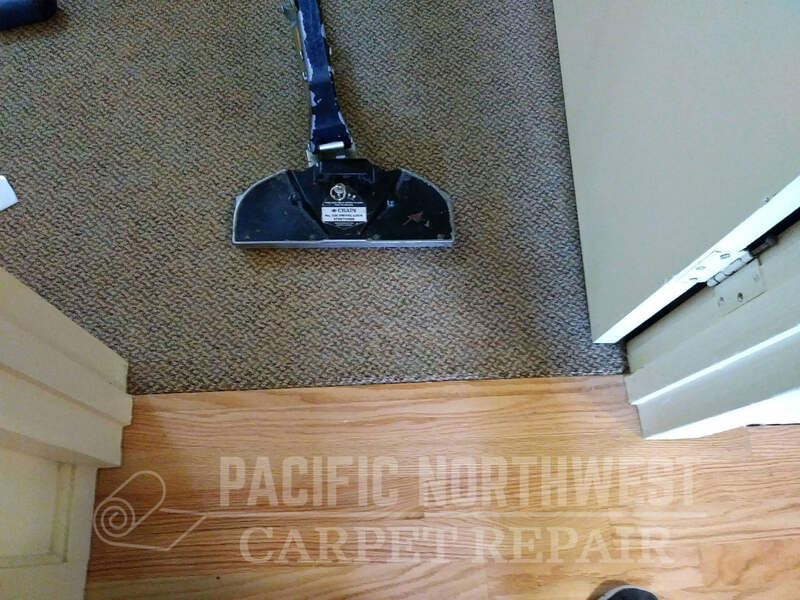 Pacific Northwest Carpet Repair – All Carpet Repair and Cleaning Services! Call or Text Today for Your Carpet Repair Estimate! 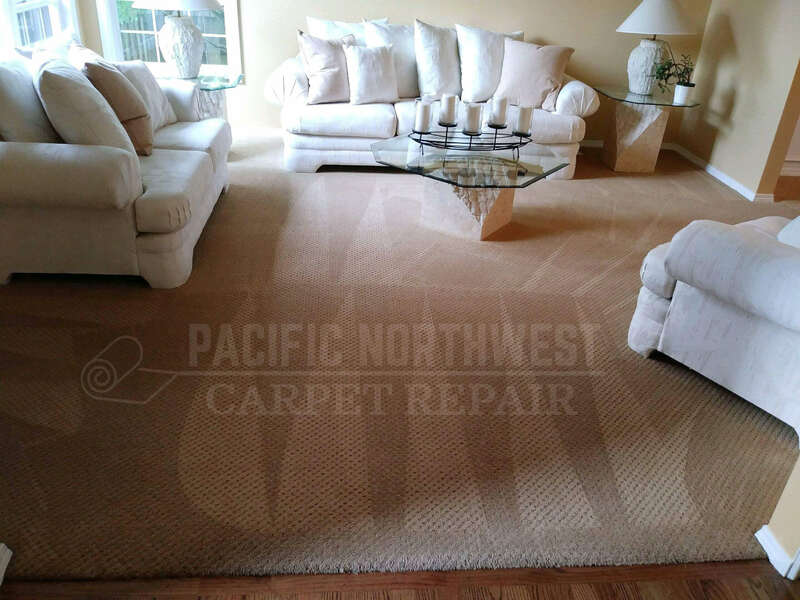 Thanks for visiting Pacific Northwest Carpet Repair! Proudly servicing Greater Portland, Vancouver, Bend, and all of Central Oregon. We offer carpet repair, and cleaning services, to both residential and commercial properties. Call or text today, to see how we can help! Carpet repair is our specialty. But really, if there’s something going on with your carpet, being able to do everything possible to remedy your situation, is our specialty. Your service request will be scheduled promptly, and you won’t be disappointed with our work. We backup all carpet repair w/ our Money Back Guarantee. Carpet patching and carpet stretching are our two most popular services, but we gladly do anything your carpet needs. Please see below for examples. 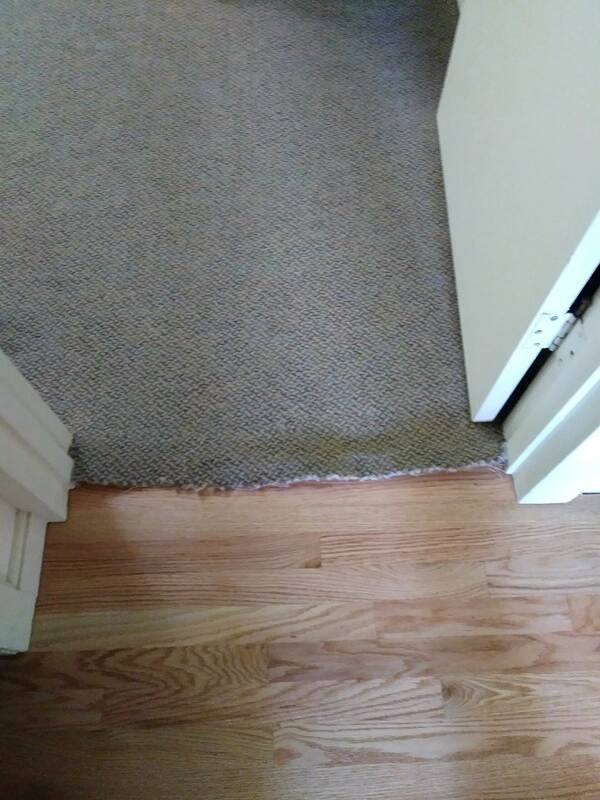 Here’s an example of a bleach stain, replaced by a carpet patch. We can cut out any type of damage, and replace the area with a carpet remnant. If you don’t have remnants available, we take carpet from anywhere you won’t miss it, like the back of a closet. If you can’t leave a bare spot anywhere, or don’t want to, we can usually provide something good enough, to put back into area where carpet is taken from. Here’s more details about our carpet patching! Carpet stretching is a solution for many carpet issues. Here, we stretched carpet into a doorway, providing enough slack to finish carpet with nice, flush edge at laminate transition. Stretching removes any looseness and tripping hazards. And gets your carpet back into proper place, so it will last like it’s supposed to. Check out our stretching page for in-depth information on how we stretch carpet, and why it’s best to take care of any stretching needs asap. If you find yourself wondering what you can do about your carpet, please call or text today! We’d love to answer any questions you have. More often than not, unique carpet situations arise. And with combination of a few repair methods, these situations can be fixed! Before you do some remodeling and remove a wall, your carpet is fine. After you move your wall, everything changes. In a situation like this, as shown above, we would perform patchwork after completing some subfloor-prep work. And possibly reconfigure your original installation layout. Sometimes, you end up with a whole room of remnant carpet, or more. Which enables you to perform all sorts of upkeep and upgrades. We use a top-of-the-line truck-mounted steam clean system to perform our carpet cleaning. We pre-treat all areas, and perform extra spot treatment as necessary. Cleaning cost is approximately $30-40 per area, depending upon soil level. We can usually schedule for within 3-4 days of service request. A lot of the times sooner! 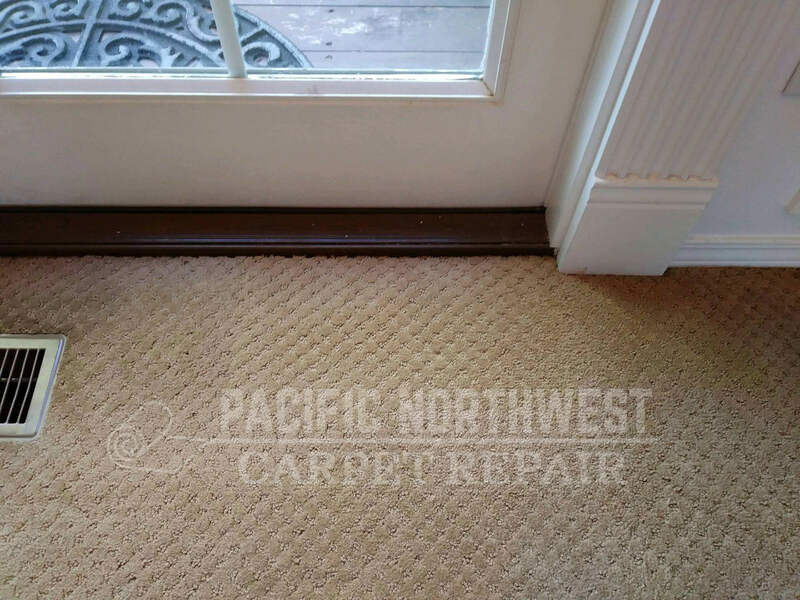 I have needed my carpets repaired on 2 occasions at different houses, and PNWCR did an amazing job both times. They were professional, reliable & reasonably priced. I would definitely use them again if I ever need future repairs. 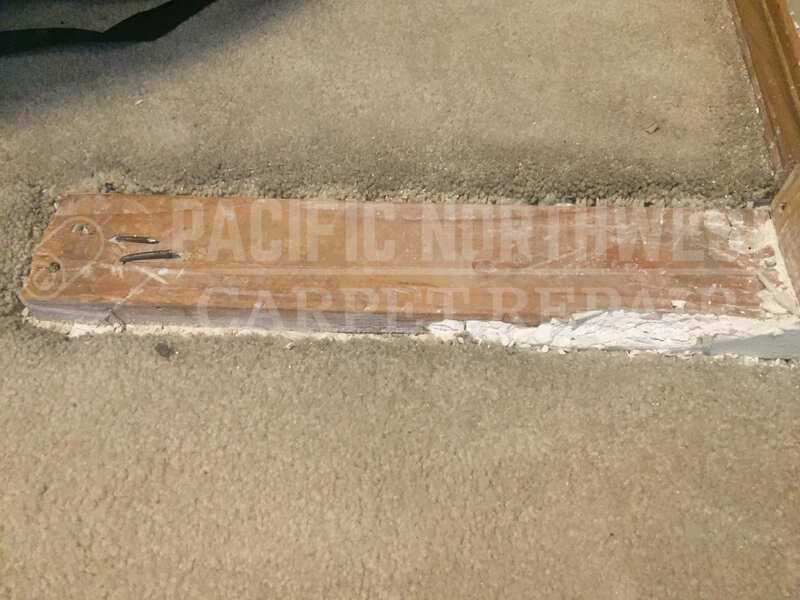 I started out not really knowing what I needed other than we had a less-than-4-year old carpet and it had some bad wrinkles in it and new ones gradually appearing.I found PNW Carpet Repair online and hoped they could come out and advise on how to fix this. They were very responsive and reassuring at each stage and gave me an accurate estimate over the phone which was in the lower end of the ball park, once they could see the job in person.The repair was carried out well and we were amazed at how much it fixed the problem. We previously had big ridges in the bedroom, a hallway and a living room as well as a ridge so high that the closet door was starting to catch it. The repair took care of all the ridges where some are already invisible and the bigger, older ones look like a faint shadow which I was told would diminish over time, as it was vacuumed.I would definitely recommend this company and the work they do. In our case, the job was done relatively quickly for the number of rooms and the clean up was carried out effectively. Our carpet was not installed correctly but with this service, we have been able to get it back to where it should be for its age, without the massive outlay for a whole-house replacement carpet.I got a lot of credit from my wife for taking care of this unsightly carpet but obviously the credit should go to PNW Carpet repair who did all the work! Contractor arrived on time, did an amazing job, and left my home spotless! Would recommend to anyone. Absolutely incredible job! I couldn't even tell that there was ever a spot that needed to be touched up! Friendly, knowledgeable professionals. They did a great job repairing my carpet. They also followed up to make sure I was happy with their work. Great job. I could go on and on about how positive my experience was but I’ll try to keep it as concise. I had a few flooring companies and contractors turn down the job for one reason or another. I called PNW Carpet Repair and told them I needed this done as soon as possible. Now this was the day before thanksgiving so I wasn’t expecting them to be able to have an open schedule for a bit. They came the morning after thanksgiving, confirmed the estimate they gave over the phone and got the job done all in less then and hour! I had one contractor tell me it would take four hours. Seriously, I can’t recommend them more! We had several rooms where the carpet had buckled leaving ridges in the carpet. 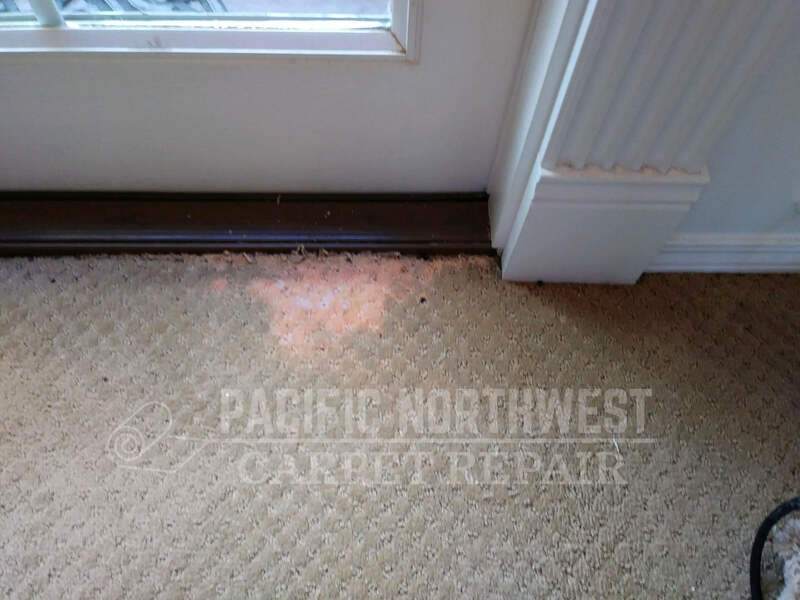 We had several people come and look but Pacific NW Carpet Repair said they could do the job (others could not) and did it very professionaly. Very happy with the results. I had NW Carpet Repair come out and stretch my carpet in two rooms and also stretch the carpet at my parent's house in 3 rooms. They did an excellent job! They arrived on time and it didn't take them very long to complete the job. Very professional and they know what they are doing! Rates are reasonable, too!